Unleash the Power of the Chamber Card. Sail in search of pirates plunder and swashbuckling adventure in the Pirates of the Caribbean Trading Card Game. Join the action as you clash cold steel in epic sword fights, encounter the monstrous sea Kraken, commandeer mighty sea ships and let loose an explosive broadside of cannon fire! You'll need a pirate's cunning to master the Gold Doubloon game cards, an amazing treasure buried only in the Pirates of the Caribbean Trading Card Game! Explore a cast of new pirates in the Caribbean! Keep the action intense as you utilize most of the cards in your deck EVERY game! 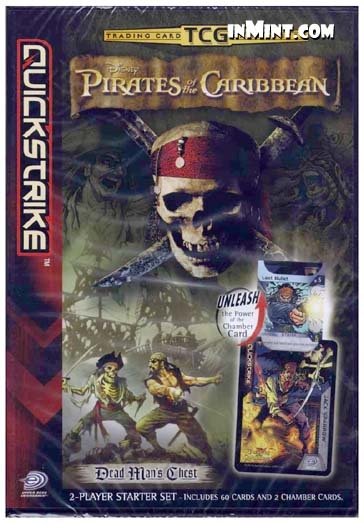 Pirates of the Caribbean is part of the QuickStrike TCG system and is compatible with other QuickStrike card games. Find special exclusive Gold Doubloon cards that unleash the full power of each pirate! Chamber Card technology revolutionizes trading card gaming, as you strategically decide when to slide open your card and reveal your pirate's hidden moves! QuickStrike Trading Card Game System. Includes 60 Cards and 2 Chamber Cards.